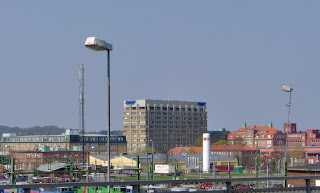 Some years ago I worked on a project for SKF in Göteborg (Sweden). I was mainly during the winter months, meaning very cold and dark in Sweden. For the Swedes cold winter weather in Göteborg isn't even cold, since it's in the southern part of Sweden. Way up North is cold as they say. Where cars are connected to electricity posts to heat the engine and avoid frozen oil. If a truck starts driving in the morning it feels like driving on a bumpy road due to the tire being frozen and having a flat spot where it was on the road all night. Maybe I'm a sissy, but for me Göteborg was cold. Lunches at SKF main office were hearty and rich. 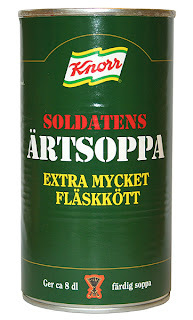 Every Thursday it was traditionally Ärtsoppa and Pannkakor (yellow split pea soup and pancakes). With the soup you had dark brown bread and Sennap (strong mustard). The pancakes came with Hallonsylt (raspberry jam). After such a lunch one can go outside in the cold again.